Myopia (or short-sightedness) is when near objects are easier to see than distance objects. Research currently suggests that it is caused by both environmental factors (e.g. prolonged near work) and genetic factors. 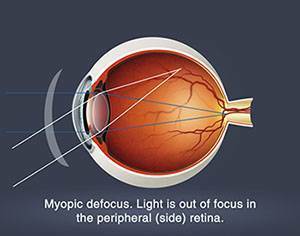 Over the past decade there have been significant advances in this field such that we now have a better understanding of what causes myopia to progress. Researchers now believe that a major factor in the progression of myopia is peripheral hyperopia (or long-sightedness). The eye elongates as a result of this peripheral hyperopic defocus which in turn causes an increase in the central myopia. The best methods currently available are Atropine eye drops, multifocal soft contact lenses and orthokeratology (also known as corneal refractive therapy or Ortho-K). Atropine Eye DropsAtropine is an anti-muscarinic drug that causes pupil dilation and cycloplegia (loss of accommodation). Originally this drug was thought to reduce myopic progression by eliminating accommodation, but it has since been shown to be a local retinal effect that slows myopia progression. Atropine will cause the side effects of increased light sensitivity and blurred vision at near as a result of the pupil dilation and cycloplegia. Consequently, multifocal spectacles incorporating a photosensitive tint (Transitions) are usually prescribed as an adjunct to the Atropine therapy to help manage these side effects. Multifocal Soft Contact LensesThese lenses seek to control the progression of myopia by correcting for the peripheral hyperopic defocus (which as discussed above is thought to be a major factor in the progression of myopia). The multifocal contact lens has a central distance portion – which corrects for the myopia – and a peripheral reading addition – which corrects for the peripheral hyperopia. These multifocal soft contact lenses are similar to those routinely worn to help people over 45 read clearly as well as see far away. The main difference is that the multifocal soft contact lenses used for myopia control have a centre distance and outer near design, while the multifocal soft contact lenses worn by older patients usually have a centre near and outer distance design. OrthokeratologyOrtho-K is the programmed use of rigid contact lenses – which are worn during sleep – to remould the shape of the cornea to reduce or eliminate myopia. In some ways this is similar to the use of dental braces by an orthodontist to straighten crooked teeth. The cornea is highly elastic and always returns to its original shape. For this reason, retainer contact lenses are worn typically four to seven nights per week. 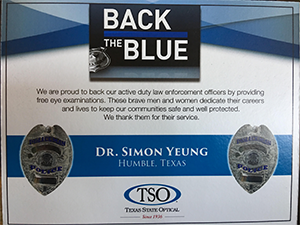 Texas State Humble specializes in Myopia Control and can help prevent your child’s myopia from getting worse. Please call us today and schedule an appointment to discuss the various treatment programs that will work best for your child’s vision and lifestyle.